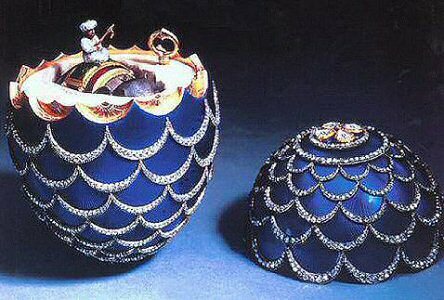 The 1900 Pine Cone Egg is made of gold, silver, rose-cut diamonds, brilliant diamonds and translucent royal blue enamel. The miniature elephant is made of silver, gold, ivory, rose-cut diamonds and red and green enamel. One end of the pine cone, a symbol of Resurrection, is set with four petal-shaped portrait diamonds, forming a quatrefoil enclosing the date "1900". The opposite end is set with a rose-cut diamond star, enclosing a portrait diamond over a later miniature of a young woman, presumed to be the Dowager Empress Maria Feodorovna. The Egg originally bore the monogram B.K. beneath the portrait diamond, probably similar to that of the 1899 Kelch 12 Panel Egg. This replacement led to the assumption that the Egg was an imperial gift, which it was not. 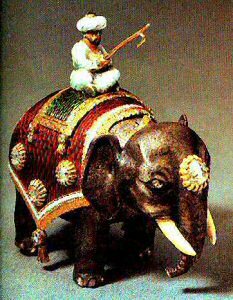 The exquisite Egg shell opens to reveal, in a fitted velvet compartment, an amazing surprise, an oxidized silver Indian elephant automaton with ivory tusks supporting an enameled turbaned mahout seated upon a gold fringed red and green guilloche enamel saddle cloth. Each side is set with three rose-cut diamond collets, one covers a keyhole. When wound with the original gold key, the tiny elephant, lumbers forward, shifting its weight from one side to the other, all the while turning its head and flicking its tail. At one stage the Egg was thought to be an Imperial Easter gift, but now it is known to have been the third in the Kelch series. The fact that an elephant was the surprise added to the confusion, since the elephant appears on the royal Danish Coat of Arms, and Maria Feodorovna had been the Danish Princess Dagmar. 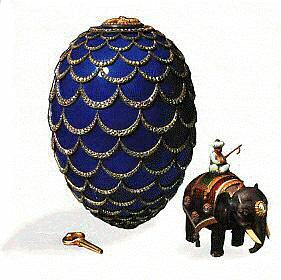 Fabergé had already used a miniature elephant as the surprise for the 1892 Diamond Trellis Egg for Maria Feodorovna and he would use it again in the 1917 Birch Egg that sadly never reached the Dowager Empress. Eggs of such grandeur were made for only a few customers apart from the Imperial Court. The Egg, technically and esthetically on a par with the finest Imperial Eggs, is proof that Fabergé maintained the highest standards for all clients, not just for the imperial Family. Easter 1900 given by Alexander Kelch to his wife Barbara. 1920, one of the six Kelch Eggs sold by Morgan, Paris, a La Vieille Russie, Paris. 1928 sold to a US buyer. 1929 - 1989 private Collection United States. 1989 sold by Christie's Geneva to a Daniel Grossman, acting for Joan Kroc (widow of Ray Kroc, founder McDonalds's chain). San Diego, California U.S. 1997 offered by Christie's (New York) collection Joan Kroc, passed at 2,8 million dollar. Presale estimate, $3,5 to 4,5 million.